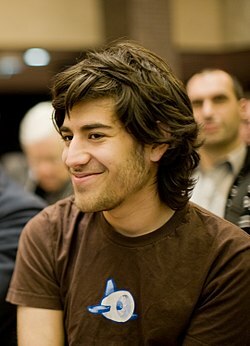 Aaron Swartz ended his own life Friday. In his 26 years he invented RSS, which makes this blog possible, and then dedicated himself to fighting for internet freedom. …He committed himself to the causes in which he so passionately believed: internet freedom, civil liberties, making information and knowledge as available as possible. Here he is in his May, 2012 keynote address at the Freedom To Connect conference discussing the role he played in stopping SOPA, the movie-industry-demanded legislation that would have vested the government with dangerous censorship powers over the internet. Critically, Swartz didn’t commit himself to these causes merely by talking about them or advocating for them. He repeatedly sacrificed his own interests, even his liberty, in order to defend these values and challenge and subvert the most powerful factions that were their enemies. That’s what makes him, in my view, so consummately heroic. You can read the whole article here. I highly recommend it. Aaron’s last great act of activism was one that ultimately landed him in felony charges: legally and within the terms of his user agreement, he downloaded piles of academic articles from JSTOR. He had the intention of making these public for free (which would not be within the user agreement). When JSTOR pulled the plug, he chose to trespass in MIT in order to retrieve the files and prep them for public distribution. I want to repeat that: in order to give you and me free access to scholarly articles, he broke into a campus and stole them. That makes him the closest thing I’ve seen to a real-life cyberpunk protagonist. Except that in fiction, it’s a gritty anti-hero doing it for money or to settle a personal score. Aaron did it just to follow his ideals. Often, people ask me what heroism looks like if you don’t want to travel, if you’re not physical, if you don’t fight or run into burning buildings. This is what it looks like. Aaron was a computer programmer. He took great personal risk in order to help others. He had nothing to gain from it. He was prosecuted on trumped up charges and, his family says, that contributed to his suicide. I grieve for Aaron and his family. And I admire him greatly. Its smoke will drift on. The flame is now gone. Our turn to be bold. Aaron’s memorial page is here. ← Are Your Gods So Easily Offended? “In order to give you and me free access to scholarly articles, he broke into a campus and stole them. Often, people ask me what heroism looks like if you don’t want to travel, if you’re not physical, if you don’t fight or run into burning buildings. This is what it looks like.” Rogue Priest Drew Jacob has beautifully honored Aaron Swartz’s memory in the above post. Rest in peace, Aaron. You will not be forgotten for everything you did to uphold your selfless ideals, for your belief that free access to knowledge is not a luxury but a right. Your existence and heroism is an honor to humanity and an inspiration to anyone that would care not only to dream, but to live in a world of equal opportunity. So sad indeed, prayers always for his soul and – for those who come after, courage. My heart grieves for many reasons I know and reasons I don’t know. Fly swiftly to the halls of your noble ancestors, Aaron. You will be remembered.